Our Corn Tortillas and Chips are made from whole kernel corn, cooked to bring out the corn’s natural flavoring. We don’t alter the corn’s own subtle flavoring by adding preservatives to our corn product. All of our corn tortillas are made with no added chemical preservatives. We deliver fresh! After cooking, the corn is ground with our hand-carved stones to the perfect consistency for the product you order. We know the difference between a chip tortilla and one for enchiladas! Our processes allow us to custom grind the corn for each style we offer. You can choose from a wide range of products made from whole kernel white, yellow, or blue corn as well as many specialty items such as brightly colored red, blue, green and orange tortillas for chips or our rich and spicy Red Chili Corn tortillas. 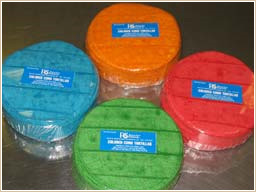 We also make a full line of Maseca (Corn Flour) Tortillas for your special menu needs. Please continue to scroll down to view a detailed list of all our Corn Tortilla products. 100750 Corn Maseca 7 oz 5"
101040 Corn Maseca 10 oz 4"
101050 Corn Maseca 10 oz 5"
110450 Corn White 4 oz 5"
110750 Corn White 7 oz 5"
111050 Corn White 10 oz 5"
121050 Corn Yellow 10 oz 5"